Laser ablation is the name for a new technique to remove varicose veins. Laser energy is used to heat the vein in order to destroy it. A fine tube (catheter) is passed through the skin near the knee and then threaded up the diseased long saphenous vein. The catheter is attached to a laser that heats the end of the catheter. The heat seals the walls of the vein so that no blood can flow through it. The operation can be done under general or local anaesthetic. We normally use local anaesthetic since this allows a more rapid recovery after treatment. How is EVLT different to standard surgery? Standard surgery usually requires a cut in the groin to tie off the vein, after which it is removed by a stripping device. This can cause significant bruising. EVLT avoids the need for a cut in the groin and there is minimal bruising so people who have EVLT can usually return to normal activity sooner than those who have standard treatment. Is EVLT better than standard surgery? The main advantage of EVLT is that after the operation there is very little discomfort and bruising compared to conventional surgery. In the long term an excellent cosmetic outcome can be expected from either technique. There is a similar risk of recurrence following either procedure. Is everyone with varicose veins able to have EVLT? No. Some people have large, winding veins that are not suitable. Recurrent varicose veins after previous surgery are often unsuitable for EVLT. We will be happy to discuss whether your veins are suitable for EVLT. About 70% of people with varicose veins can be treated with EVLT. Is EVLT all I need for my veins? EVLT (VenaCure EVLT) will remove the major superficial veins, including the LSV and anterior thigh veins. It is, however, usually necessary to have the bulging veins around the calf removed. We usually treat these veins with foam injections at the same time as the EVLT treatment. What are the advantages of EVLT? Apart from the lack of a cut in the groin, there is minimal bruising of the leg and people can return to normal activities more quickly. EVLT (VenaCure EVLT) uses special catheters as well as ultrasound imaging during the operation. This leads to increased costs compared to standard surgical treatment. Will my insurance company pay for EVLT? Most insurance companies will pay for this treatment but you will need to consult your insurance company before starting. Why do some surgeons not offer EVLT? There may be many reasons. Some surgeons may not have been trained to use VenaCure EVLT. They may prefer an alternative technique like RF ablation, or they may feel the operation takes longer than traditional surgery. If your surgeon does not offer a treatment that you have read about they should be able to give a reasonable explanation. Are there any complications associated with EVLT? There is a small risk of burns to the skin and possibly a slightly increased risk of deep vein thrombosis (DVT), as with all treatments for varicose veins. Some patients who have EVLT experience an odd sensation or sensitivity in the thigh. This tends to start about 3 to 5 days after treatment. The sensation disappears in most people within a few weeks. Very rarely (1 in 200 chance) the discomfort can last longer and be more intense. This can also occur with traditional surgery and laser treatments. Are there any alternatives to EVLT? The least invasive method of treating varicose veins is ultrasound guided foam sclerotherapy. If you would like to avoid surgical treatment, this is a further possibility. A technique using an RF catheter to heat the blood in the long saphenous vein is available in some centres. We regret that we are unable to offer this at The Beacon Clinic. EVLT is performed in a treatment room or operating theatre under local or general anaesthesia. 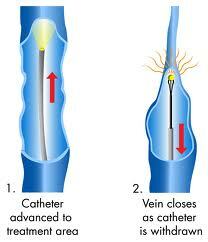 An EVLT catheter is threaded along the vein under ultrasound guidance. Local anaesthetic is injected around the vein. Electrical heating is used to destroy the vein as the catheter is withdrawn. Varicose veins are removed through tiny cuts in the leg or injected. Under local anaesthetic only very minor discomfort is felt. Following treatment we apply a firm compression stocking to the leg which should be worn for 1 week. Most patients are able to leave the clinic immediately after treatment. Some discomfort or numbness may be felt in the leg. What is it like afterwards? Immediately after the EVLT treatment patients are able to walk normally and continue their work. Vigorous exercise should be avoided for the first week. The leg may ache initially and this continues for 2 – 4 weeks, but is not troublesome. Some patients need to take simple pain killers for this. If your treatment has been performed under general anaesthetic we recommend that you avoid long haul air travel for 4 weeks. For patients treated under local anaesthetic we suggest that avoidance of long haul air travel for one week following treatment. Journeys of less than 4 hours need not be restricted. Any varicose veins which remain after treatment can be managed by a session of injections. Your consultant would like to check that the treatment has worked and treat any remaining varicose veins one or two weeks following the main treatment. Call The Vein Clinic for an appointment. You should contact your consultant for advice should any other matter arise in connection with your treatment. This treatment may result in the development of thread veins in the region of treatment in susceptible people. These may be treated by microsclerotherapy, if necessary.